Marc Benioff is a great showman, salesman and speaker. His annual show, Salesforce.com’s DreamForce, has become the show to attend for application software buyers globally. Last week’s event was a high-energy affair chock full of product announcements, glowing customer testimonials and more. Marc’s keynote often sets the standard for what other vendors’ user conferences should aspire towards – but don’t achieve. Salesforce.com is simply too far out in front of the mainstream application software marketplace with their multi-tenant cloud applications, a PaaS (platform-as-a-service) called force.com, a huge ecosystem of software partners that have created applications on the platform (e.g., three ERP product lines alone), a Java developer platform (i.e., VMForce), cloud database solutions and much more. 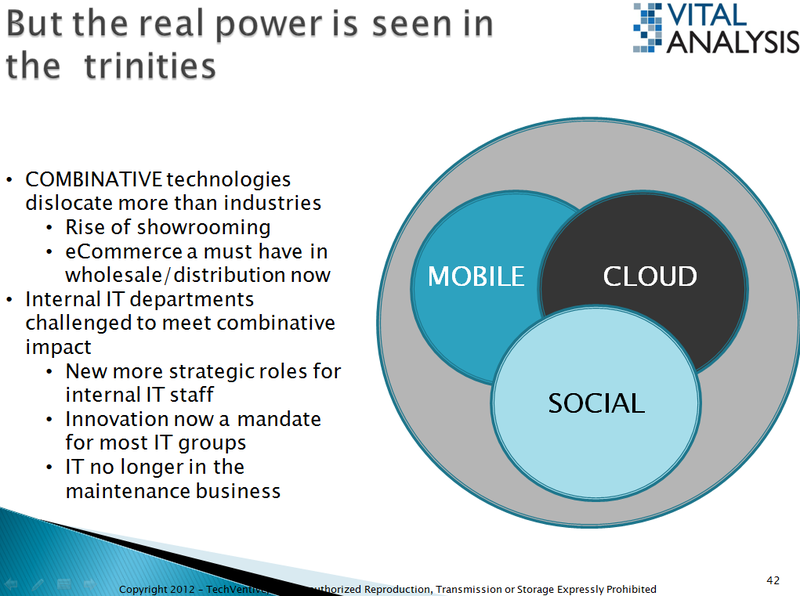 His competitors are late digesting last decade’s (and older) acquisitions and have only recently ‘discovered’ the cloud. This year, Marc reinforced the “business is social” theme by bringing in a veritable who’s who of CEOs to discuss how their firm is reaching new buyers via new media. These conversations showed how businesses are marketing, conducting commerce and more through the use of unstructured data, via the Internet and through new kinds of systems not found in more mainstream ERP product lines. These CEO discussions also showed a widening gap between the companies that get social and those that don’t. “Last year, in 2012, we told you that business is social. We showed you how human resources can be social through our new work.com product. We told you that salesforce.com would soon experience a 1 billion transactions per day event. And, I’m happy to report that we not only met the challenge but we’re now currently exceeding 1.3 billion transactions per day on a regular basis. But this morning, I really want to focus on the business — the business of your firm. I want you to get comfortable while I articulate a vision we see rapidly coming up on businesses everywhere today. This is a vision told in several ‘trinities’. From our humble beginnings in 1999, we knew that three forces would converge that would fundamentally change business and technology. Those forces were cloud technology, mobile technology and something we didn’t fully understand in its entirety in 1999: social technology. 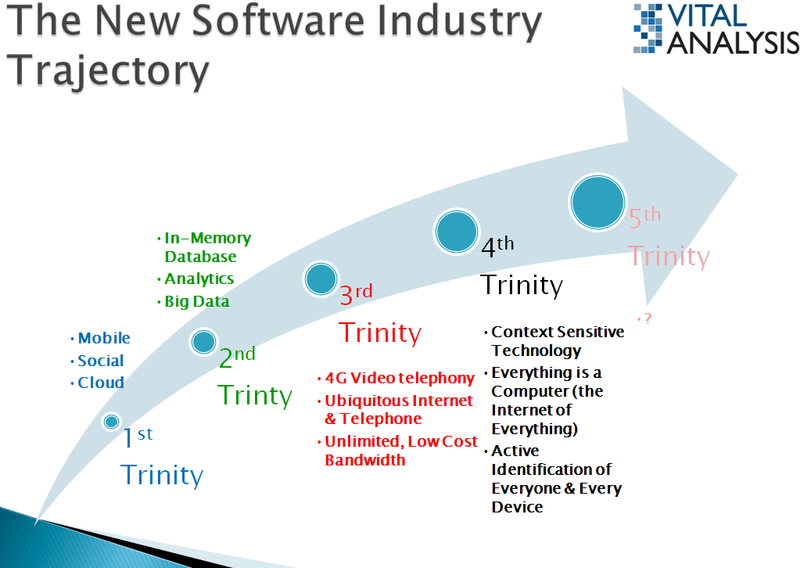 These three technologies became the first trinity of truly transformative technology. Today, in 2013, we are proud to announce that salesforce.com has absolutely and totally dominated each of these three computing disciplines individually, but have also delivered solutions that absolutely exploit the bestcombined characteristics of all three. The combination is the key to understanding change and change in business. And in our boldest statement to date, now some 14 years after we were founded, we say to you, to our competitors and to the customers to come that salesforce.com has absolutely and unequivocally mastered the opportunities presented by the combination of cloud, mobile and social technologies. Now, as we look towards the future, a future that I might add that our competitors still cannot grasp as they are still trying to understand the individual technologies of the last decade, we see a new trinity of technology is about to impact the worlds of technology and business. The second trinity is comprised of three things: powerful analytic applications, in-memory database computing capabilities and big data. I’m sure some of you will be thinking right now, “But wait Marc, hasn’t salesforce.com already been focused on these technologies, too?” You’re right, we have but we did so in a singular not combined fashion. Our Radian6 product has been making sense of the gargantuan volumes of unstructured data found on the Internet, in Twitter streams, Facebook updates, blog posts and more for years. We’ve been making short work of big data for a long time. But we used it as an adjunct of our core CRM product line. We used it to monitor sentiment analysis among customers. The true opportunity behind this may be far greater than anyone’s initial estimation. Now, we’re pleased to announce a number of new capabilities will soon help our customers handle a greater variety of big data types like weather information, point of sale transaction data and more. We’re making it easier than ever for every company in this world to integrate, compare and enhance their traditional, internal ERP data with structured and unstructured data regardless of its origin or size of its databases. Our channel partners are building incredible new optimization programs built on new force.com extensions that will marry this traditional transaction data to the new, big data sources. Businesses will have a better way to understand who to staff and how many people to staff at their retail stores based on current weather forecasts. Companies will be able to look at retail cash sales of their customers’ customers and use those to better plan their inbound supply chain purchases. In short, we will make every salesforce.com customer that utilizes these new second trinity technologies the most competitive and the most profitable companies within their industry vertical. When we tackled the first trinity of mobile, cloud and social, we saw this as a way to democratize technology, to connect businesses better with their employees and customers and deliver a whole host of other benefits to you. The second trinity will create insights. Insights so amazing, so bold so competitively advantageous that it will create a huge gap between the businesses that do not know how to optimize their operations versus those who measure and understand everything from customer sentiment to buying trends to seasonality changes to potential product defect monitoring and a whole host of other forward-looking opportunities. The second trinity is about harnessing opportunity. And that’s why we’re announcing bigopportunitynow.com. bigopportunitynow.com takes the best capabilities we, our customers and our cadre of partners have created around analytics, in-memory database technology and big data. Think of bigopportunitynow.com as the most awesome executive dashboard you could ever imagine. This technology is monitoring massive amounts of information, news events, commodity price changes, regulations, collections, and so much more. It looks at the explicit and implicit actions of your competitors and highlights for you potential opportunities your firm should be exploiting. With bigopportunitynow.com, salesforce.com is delivering the innovation your firm needs to compete in this new economy. We are delivering the innovation so that you have the opportunity to exploit the new knowledge needed to win in the ever quickening and competitive global marketplace today. But the change is not going to stop there. My business partner, Parker Harris, and I talked about another trinity forming these days. This one is comprised of 4G mobile telephony, ubiquitous telephone and Internet access around the world and the rise of video as a business medium. We believe that virtually every business process is going to be impacted by the rise of these three converging technologies, too. For example, call centers are something that salesforce.com is intimately familiar with. Our technology has been used in call centers for more than a decade. But, how does the call center world change when customers will be calling in expecting a full motion video to full motion video telephone call? I believe video will transform every business process and, by extension, every business system. We’ll need new storage and retention protocols to save our video calls not just our emails. We are investigating and experimenting aggressively here as last year’s iPhone 5 and the Android phones are technically ready for this world. So are your customers and suppliers! “We’re also studying other combinations of technologies that are bit further out still but will undoubtedly change business, competition and software. We’ll share more of that in next year’s DreamForce 2014. “FANTASTIC – that’s how’d I describe the parties, the enthusiasm and discussions yesterday. I really hope you got to listen to the concert we had out front – especially when The Who played “Won’t get fooled again”. I asked my good friend Roger Daltry to play that number for all the Oracle customers at the event. I’d like to kick today off with a peek into our application strategy. Yesterday, we covered a lot of ground when we spoke of the technology trinities guiding our overall product and market strategy. But, today, I want us all to see how and what we and our partners are developing with regard to applications. I see salesforce.com as the incubation engine of thousands of new application software companies in virtually every functional area in every vertical. We’ll help existing and all-new companies create the future of application software, and, in the process, help them possibly overtake the SAP’s and Oracle’s of the world. We’ll provide them the fastest development environment, biggest commercial Platform-as-a-Service (PaaS), an online database and connections to our amazing VMforce environment. These tools, the same tools we make available to all of our customers, are becoming THE industry standard in the application software space. Since our inception, we’ve provided technical assistance to a number of firms to help them build new applications on the force.com platform. That’s not changing. We’ve also made some strategic investments in some of these firms, too. Those capital infusions sped up their time to market and helped put them on the map. We’ve done that with FinancialForce.com,Kenandy and others. That’s not changing either. Sometimes, we even grew to like the company, its products and its team so much, we bought them. We did that with Radian6, Heroku and others. That’s not going change because I’d rather see us acquire our partners rather than take their ideas and leave them high and dry. But, we now have the market size and resources to do more. Let me share a new development with you now. salesforce.com providing these grains of sand to dozens, no – hundreds, of software developers globally. Our grain of sand, if you will, can be anything from a full-application, like our flagship CRM solution, to an all-new application, like last year’s announced work.com, to a stated intent to develop a new application or vertical niche. For example, just look at how our efforts have led to the most powerful sales force automation and customer relationship ecosystem on the planet. Our little grain of sand, Salesforce CRM, has attracted players like Eloqua, Pardot, Marketo and hundreds of other firms to make the richest, most powerfulüber-suite in the space. Already, we’re seeing a host of firms flocking around our work.com product. They want to bring training course content, payroll processing, recruiting capabilities and more to this space. AND, we will help them do so. Within another year, I predict we’ll have the world’s greatest and most complete HR suite of products – period. We’ll build it with partnerships, like our partnership with Workday. Last year, we announced our intent to build out the marketing solution space. And now we have an amazing number of new partners and products targeting that space with solutions that work, 100%, on the force.com platform and with all of your salesforce.com products. Oyster will be the way we create energy, intellectual property, software, products and content around every part of your business. Salesforce.com will create a piece of the solution while partners will use our tools, our platform and our AppExchange to develop and deploy a new generation of solutions with speed and quality. It will be unmatched in the industry. We will provide the spark – the catalyst – that triggers the network effect. If you’re still waiting for your software vendor to make good on their promises from 2005, it’s time to reconsider. We would never think of ‘stalling’ as a strategy. Even if we can’t make every enterprise application in every vertical for every part of the world, we will get the best and brightest partners who will. And, we’ll make sure it all interoperates, seamlessly for you for all time. The salesforce.com difference is clear: we don’t have to control your entire technology stack. We don’t have to build it all and we don’t think it’s reasonable or realistic for any software vendor to think they can. We want to build the richest software ecosystem populated with the best applications in the world. We remain the catalyst for innovation in this industry. Others choose to be the impeders of innovation. The choice is clearer than ever now. – Innovation can be collaborative – I’m pretty sure Marc gets this as salesforce.com seems to live this daily. I think the way they treat their partners is key especially as it relates to partners that build technology that other firms would expropriate while saleforce.com simply buys outright. – Customers want something different (and they’re looking) – Traditionally, the industry is all about control: account control, control of the tech stack, etc. Vendors have been building fixed fortifications around their install base for decades. Yet, a look at the DreamForce attendees shows that those within these fortresses are out there actively shopping for something new. Field artillery pretty much put an end to fixed fortifications. Maybe the ERP oligopoly is about to seem as pointless as an old stone castle. 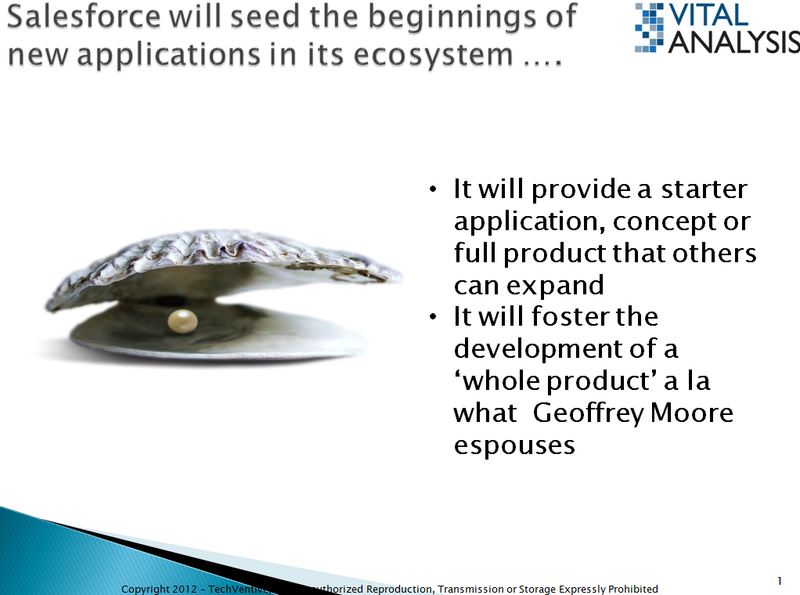 –The oyster/pearl metaphor is uncommon in software – Partnering for the long-term is one of the most unnatural acts in software. Partners, traditionally, use each other in the short-term only to double-deal the other when the moment suits them. Scorpions sting, mosquitoes bite and software vendors are the least trustworthy partners in business. It’s been the nature of the beast. But, the oyster/pearl approach is different in that salesforce.com doesn’t have to build huge application suites or huge products. I’d bet that salesforce.com would be delighted to spend as little as possible with these ‘sand’ applications and stay focused on creating the biggest, baddest application ecosystem out there. Salesforce wins when businesses run transactions on/through their environment. They win when people use their tools, servers, databases, partners’ systems, etc. They don’t need the costs and headaches associated with developing and supporting applications when infrastructure and tools are much more straightforward and less costly to support. – Analysts/Reporters don’t get this – Lots of people covering DreamForce 2012 wrote of all of the new apps announced by Salesforce. They wrote that some were too skeletal in their content. Some were only announcements. And, at this, they questioned Salesforce as being a company long on announcements and short on product capability. I think these folks got it all wrong. Since 2005, I’ve seen Salesforce put the development of its platform at the top of its priorities. It isn’t an applications firm and hasn’t been for at least 7 years. 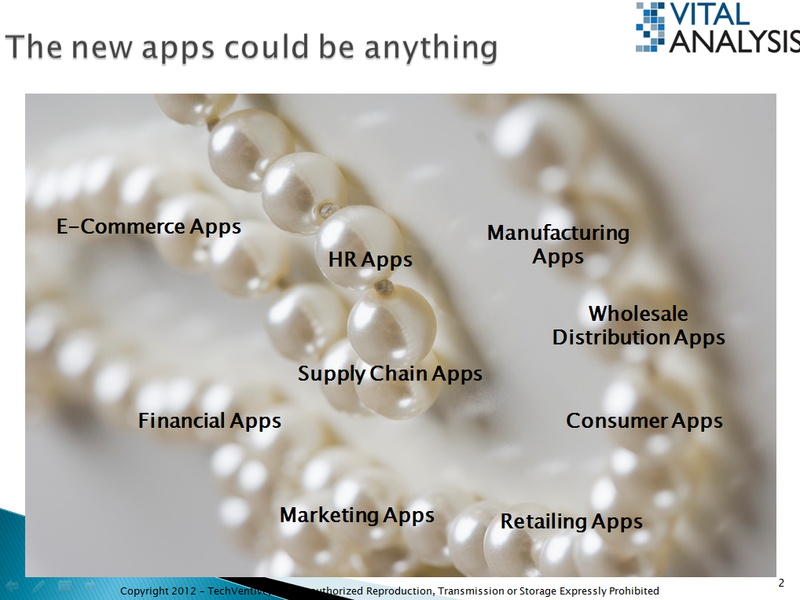 Yes, it has some apps but these are in furtherance of its bigger vision. Too bad, other vendors don’t get this, too. – Understand the ‘whole product’ concept – Geoffrey Moore described (years ago) what makes some technology take off and others fall flat. A major reason for this is that some firms only create a piece of the solution. Would iPod technology have taken off if there weren’t the iTunes store that had a vast amount of recorded music on it for cheap? Apple thought of everything and took all the friction out of owning an iPod. Think of salesforce.com as a company bent on taking the friction, headaches, time, etc. out of the software application business. Well, I’ve had my fun writing Marc’s speeches for next year. Now, it’s time to focus on the great Larry E. and the events at Oracle Open World. And, no, I’m not going to write Larry’s 2013 talks. I’ll leave that to another of the Enterprise Irregular chaps if they’d like the honor.